SAN DIEGO — Southern California anglers have enjoyed a mild winter of weather and the lack of powerful winter storms has kept the water temperatures relatively warm and we are starting to see some signs of spring-like fishing emerging in the middle of February. The mild winter has allowed bluefin tuna to remain within 1.5-day range of Point Loma throughout the winter to date. Last weekend anglers once again found bluefin tuna to 170 pounds biting in the offshore waters outside of Punta Colnett. 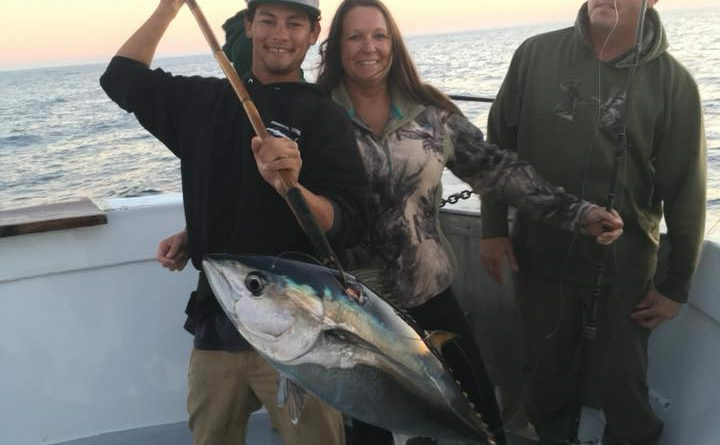 Excel out of Fisherman’s Landing fished within 1.5-day range of Point Loma on Feb. 17 and Fisherman’s Landing reported they caught 15 bluefin tuna to 170 pounds. Mustang out of H&M Landing also fished an offshore 1.5-day trip on Feb. 17 and had 25 anglers catch 125 yellowtails (limits). 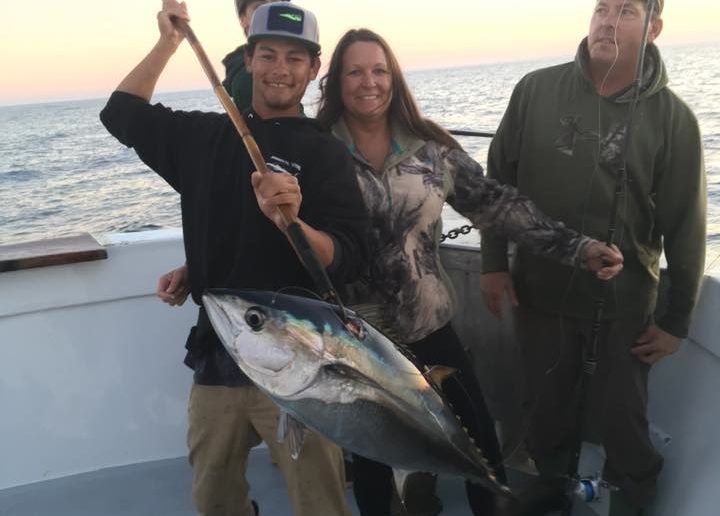 Mustang also fished an offshore 1.5-day trip on Feb. 15 and had 10 anglers catch seven bluefin tuna and three yellowtails. The bluefin tuna have been running from 20 to 170 pounds, with most catches during the past several weeks in the 30- to 40-pound range. Bluefin stops have been coming from stopping on meter marks, sonar marks, kelp paddies, spots of breaking fish and the occasional trolling strike. A good water temperature for locating bluefin has been finding offshore areas where there is relatively warm 64+ degrees. Boats fishing in closer to the coast at the High Spot area off Punta Colnett have been doing well on a mix of reds, assorted rockfish and lingcod and have also been finding occasional flurries of bonito and yellowtail action. The yellows have been hard to find during the past few weeks but Pacific Queen out of Fisherman’s Landing did find some yellowtail action. A 1.5-day trip on Feb. 17 with 24 anglers caught limits of rockfish and three yellowtails. Yellowtail have been found by locating meter marks or sonar marks and once located they have been biting best on yo-yoed iron. The fishing around Los Coronado Islands has been very good for rockfish. On Feb. 18 there was improved surface fishing activity for yellowtail and bonito when San Diego out of Seaforth Sportfishing had a three-quarter-day trip with 23 anglers catch seven yellowtails, 95 rockfish and 9 bonito. Liberty out of Fisherman’s Landing fished a three-quarter-day trip on Feb. 17 and also found some surface fishing activity. The 17 anglers aboard caught one yellowtail, one sheephead, 160 rockfish, seven lingcod and one bonito. Private boaters have also been reporting finding a bit of yellowtail and bonito action around Los Coronado Islands with the best zone reported to be in the Pukey Point area of North Island. The occasional yellowtail being reported has been biting from stopping on a meter mark or sonar mark and fishing with yo-yoed iron or with a sardine on a dropper loop rig. Anglers fishing in Southern California waters need to keep in mind that the seasonal rockfish/groundfish closure remains in effect until March 1. With the closure in effect, most anglers have been enjoying what has been good mixed bag fishing for sand bass, calico bass, sculpin and an occasional halibut. Some good news on the surface fishing front along the San Diego County coast: there was a spike in yellowtail activity in the La Jolla region on Feb. 18. New Seaforth out of Seaforth Sportfishing had a morning half-day trip with 22 anglers catching one yellowtail, 12 sculpin, four sand bass and two calico bass. Their best action of the day was on the afternoon half-day trip with 23 anglers catch one sand bass and six yellowtails. Seaforth Sportfishing reported the yellowtails were biting on yo-yoed iron and they were nice sized fish to 30 pounds. Seaforth Sportfishing was suggesting using 40- or 50-pound test for fishing yo-yoed iron. Hard bottom and structure spots have been best for the bass and the sculpin. Productive areas along the San Diego County coast listed from the south to the north have been the Imperial Beach Pipeline, the hard bottom to the northwest of Buoy #3 at Point Loma, the Point Loma Pipeline, the upper end of La Jolla, Del Mar, Leucadia, Carlsbad, the Anderson Pipeline, the Buccaneer Pipeline, the artificial reefs outside of Oceanside Harbor, Box Canyon, the Barn and San Onofre. Capt. Joe Cacciola of Sea Star with Sea Star Sportfishing and the Oceanside Sea Center reported Chubasco II has been running half-day trips and doing well on a mix of sand bass, calico bass, sculpin and an occasional halibut. Cacciola said the sand bass have been biting best and have been some nice quality sized fish. The best bait has been fishing a strip of fresh frozen squid on a lead head and whole fresh frozen squid. Hookup Baits plastics have also been working well. Productive areas were reported to be the artificial reefs outside of Oceanside, the Anderson and Buccaneer Pipelines and hard bottom areas outside of Carlsbad and Leucadia. Productive areas between the Mexico border and Dana Point providing the best chances at a halibut as listed from the south to the north have been the sandy bottom patches outside of the Imperial Beach Pier, the sandy bottom patches outside of the Point Loma Lighthouse, the sandy bottom adjacent to the structure of the Yukon Shipwreck off Mission Beach, the sandy bottom adjacent to the structure of the sunken NEL tower outside of Mission Beach, the sandy bottom off Ponto Beach, the sandy bottom adjacent to the artificial reefs outside of Oceanside and the sandy bottom off the Golf Ball area above Oceanside. Going further north a couple of the better halibut areas have been the sandy bottom areas off San Onofre and the sandy bottom outside of the San Clemente Pier. The first day of spring does not arrive until March 20, but we have already been enjoying days of spring like weather and some spring like fishing. I hope you can take advantage of the good weather days and get in on the fun fishing! Keep on fishing and I hope to see you out on the water!